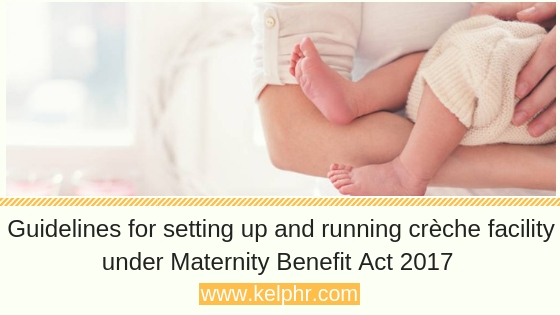 Crèche effective from: The provisions of ‘The Maternity Benefit (Amendment) Act’, 2017 are effective from April 1, 2017. The provision of crèche facility (Section 111 A) was effective from July 1, 2017. Crèche for whom: The use of crèche facility is proposed to be extended to children of age group of 6 months to 6 years of all employees including temporary, daily wage, consultant and contractual personnel. Crèche Location: The centre should be near/at the work place site or in the beneficiaries’ neighbourhood, within 500 metres. Crèche Timings: In case the establishment has day and night shifts, then the crèche should also be run in shifts. Infrastructure/ Space: At ground floor, a crèche centre must have a minimum space of 10 to 12 sq. ft. per child, separate areas for different age groups-under 3 years and 3-6 years, CCTV cameras should only be installed for the purpose of monitoring, etc.. Monitoring and Supervision: Maintaining records of Admissions, Attendance, Stocks. Also, set up a creche monitoring committee having a representation from the parents, one creche worker, creche in-charge, one admin/HR person. This should be formed for supervision and smooth running of the Crèche.